It's time for my August "Gifted Gorgeousness" update. 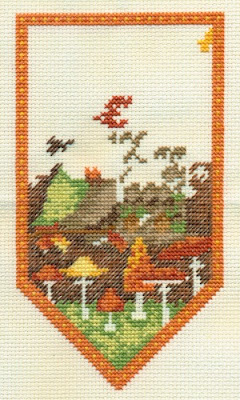 This stitch-a-long is being hosted by Jo of Serendipitous Stitching. Gifted Gorgeousness projects are projects that were made to be given as a gift, or in some way or part received as a gift. I put some time into "Hummingbird and Fuchsias" which is a printed kit that was gifted to me by my Mom. 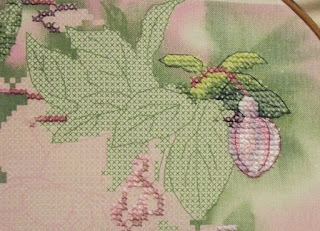 I stitched the flower bud and did the outlining of the bud and leaves. I pulled out "Gathering Honey", which I hadn't worked on for quite a long time. (Fabric and threads were purchased with a gift card.) I completed the stitching and outlining on the lower left garden section. That's all I have to show for this month's update. I hope to have even more progress made next month. Thanks for taking part in GG this month and for the lovely gifted freebie! Nice to see Gathering Honey, that was a staple of my GG posts for quite a while until I finished it and gifted it back to my friend. What lovely projects you are working on!! Seeing the buds as you stitch them, they look 3D!! 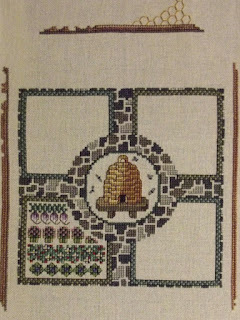 I have also stitched Gathering Honey and have it hanging in my house, it's going to be so pretty! The fall banner has all my favorite colors in it. Your ornament look great, thanks for sharing the pattern! Nice progress on the stitching, I still need to kit up Gathering Honey. 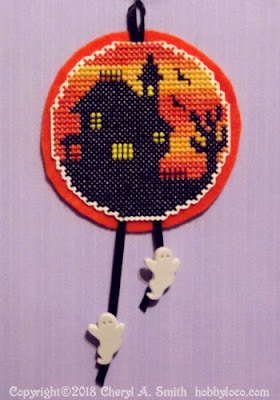 I loved how you finished the Halloween ornament!With the little ghosts and all!AriadnefromGreece!